Plush upholstery and a timeless design accents the Swanback Swivel Glider beautifully. Here at Brandenberry our gliders are crafted using traditional woodworking methods. Featuring the classic Amish technique of blending the practical and the stylish. The practical nature of this glider is seen in the flip-out footrest, swivel base and smooth-gliding mechanism. 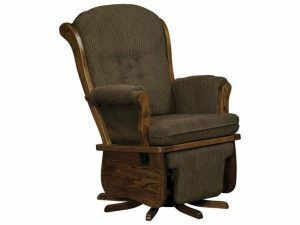 The stylish nature of the glider is seen in the sturdy Oak construction, rich wood finish and variety of custom options. Above all come browse our entire selection of swivel gliders at Brandenberry Amish Furniture. Here you can see the beauty of American-made furniture for yourself.